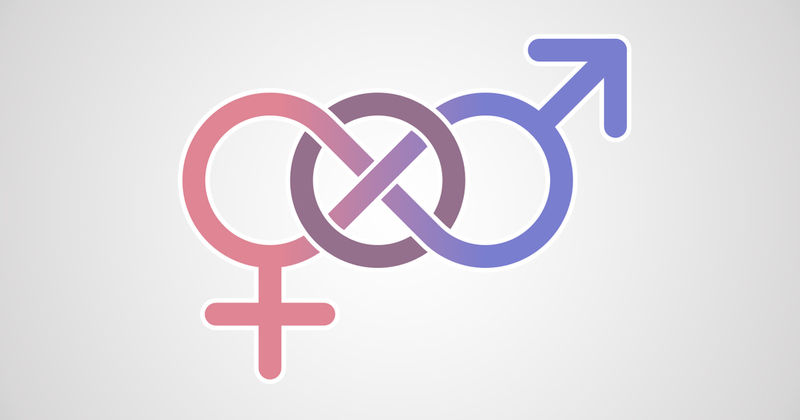 Is Your Visualization Gender Neutral? A question from Qonnections leads to a month of gender related research. Last month, while in attendance at our annual conference Qonnections, I was asked to comment on whether or not I thought that there was any inherent gender bias in the field of data visualization. And, more specifically, whether the design principals used in tools like ours could inadvertently lead to gender bias. To be clear, my qualifications to answer this question are purely biological. The group pondering didn’t feel that they could tactfully write about it because they are all male. In their defense, it was actually a heartfelt question by those who care deeply about design. There are plenty of examples of gender related design issues in the physical world. And, as a responsible company, we owe it to ourselves and our customers to ask the question. So, I volunteered to give it a think and have been mulling over the point for about a month since. My only recollection of a gender related accommodation in visualization comes from the fact that approximately 6-8% of all men are color blind. When I went looking for other examples, they were a bit hard to come by. And, most weren’t particularly compelling with the exception of one regarding 3D rendering and depth perception issues that seem to be exacerbated by gender specific hormones. I did ask a number of respected colleagues and one suggested that there might be a sort-order problem with “Men” always coming alphabetically before “Women” and “boys” before “girls”. But this isn’t true for Female/Male or F/M which I believe to be more widely utilized. And besides, none of that takes into account the fact that the massmajority of the planet doesn’t even speak English. On personal reflection, I didn’t come up with much either. (Even after a mojito which generally improves my creativity.) Frankly, I could do without the over-abundance of sports related demos. But, there are plenty of examples from sociology and economics to keep me entertained so I don’t find this particular point at all important to anyone other than me. Then there was my very non-scientific survey where I estimated the number of women in the visualization field to be in line with that of other technology fields: 25-35%. My family was also no help. Gratefully, my dear husband sees me as nothing other than an equal and just sighed at my questions. And, my children – both male – just rolled their teenage eyes at me. After the third attempt to bring up the topic at dinner, I had to concede that I wasn’t all that convinced about the idea either. So, in the end, I have to say - my answer is no. I don’t think that there is any relevant gender bias specific to data visualization. But then again… given that I am a geek girl, I might not be the right person to answer the question in the first place. I will make the point however that the real power of visualization is to give a voice to the long misunderstood data of the world. And with that power comes a great responsibility for the creators of such visualizations. Visualizations can be used to drive social change and we are seeing this in numerous examples from equal pay, to education, to political representation. In the United States, the Bureau of Labor Statistics at the U.S. Department of Labor collects data about the U.S. workforce including questions relating to gender. 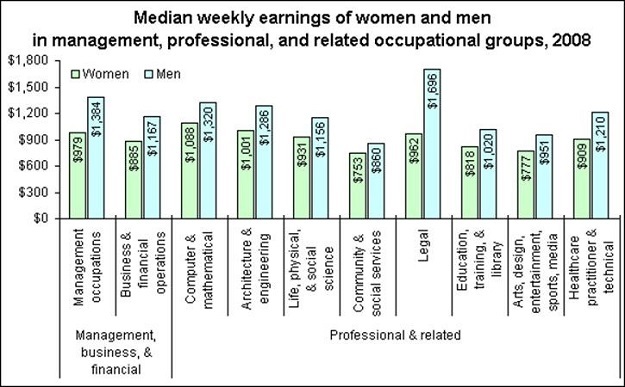 In 2003, they offered the following chart regarding women’s salaries. Seeing this chart, I might have easily been encouraged to study pharmacy or law. But in this chart from 2009, we would quickly realize that maybe law wasn’t such a great choice for me after all. Law appears to be one of the worst professions for women if what you care about is equal pay. As data professionals, we need to remember that it is easy to find data to support just about any point of view. 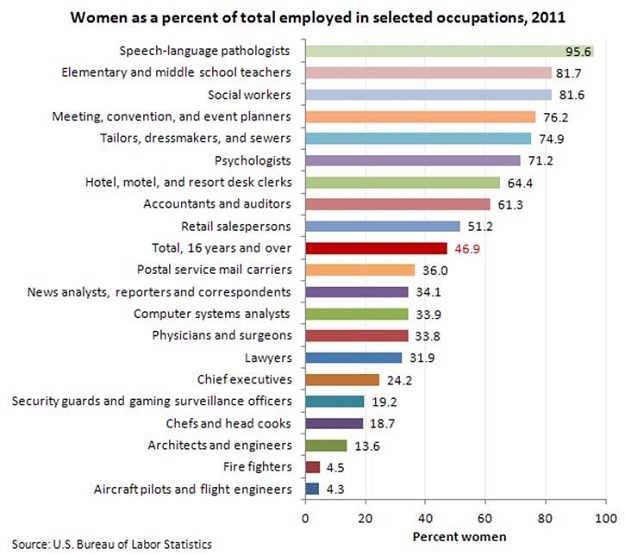 For example, rather than focusing on women’s issues, this chart published in 2012 could easily be titled “Men are severely underrepresented in careers requiring people skills.” Instead of focusing on women’s issues, I might be encouraged to investigate potential concerns about the upbringing of boys in our society. The story we tell with data is just as important - if not more important - as the data itself. 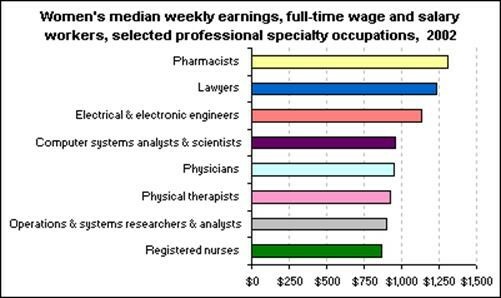 Bureau of Labor Statistics, U.S. Department of Labor, The Economics Daily, Women’s earnings in professional specialty occupations on the Internet at http://www.bls.gov/opub/ted/2003/oct/wk4/art03.htm (visited May 27, 2016). Bureau of Labor Statistics, U.S. Department of Labor, The Economics Daily, Women and men in management, professional, and related occupations, 2008 on the Internet athttp://www.bls.gov/opub/ted/2009/ted_20090807.htm (visited May 27, 2016). Bureau of Labor Statistics, U.S. Department of Labor, The Economics Daily, Women as a percent of total employed in selected occupations, 2011 on the Internet athttp://www.bls.gov/opub/ted/2012/ted_20120501.htm (visited May 27, 2016).